It is a matter of great satisfaction to all right-thinking people that the English RC Church is increasingly recovering the extra-liturgical use of the Blessed Sacrament in Benediction and Exposition. I hope mention of one detail will not seem grudging. I have seen Benediction which is interrupted after O Salutaris for a sermon. To my Anglican-trained temperament, it seems highly inappropriate that the Blessed Sacrament, exposed in the monstrance, should be unregarded while the congregation sits down and attends to a homilist. O'Connell shares my instinct; sermons, he tells us, are discouraged during the Quarant'Ore although they may be tolerated if they are about the Eucharist. And he emphasises that it is unseemly for people to turn their backs on the Sacrament. The old Anglo-Catholic practice was Evensong, Sermon, and Benediction. If it is desired to have a sermon at Benediction on its own, would it not be best to have it before the Sacrament is exposed? And, to give proper dignity to the Proclaimed Word, could not a passage of Scripture be read before the homily? Preceded, perhaps, by In nomine ... and Dominus vobiscum? Fr. Hunwicke's sensibilities are right on the mark. Perhaps they were prompted by the photo topping this story from last week's meeting of the U.S. Bishops: https://www.lifesitenews.com/news/former-head-of-dissident-nuns-addresses-us-bishops. The Blessed Sacrament exposed appears to be a sort of prop, for who knows what purpose. But an attitude of casual behavior in the presence of the Blessed Sacrament is endemic among clergy, and therefore people, accustomed to the Novus Ordo mores. 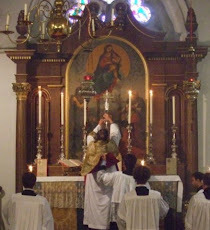 After all, the priest celebrates Mass with his back to the Tabernacle. People in the pews engage in extended conversations before and immediately after Mass. The dismissal comes two or three minutes after distribution of Holy Communion. Why on earth would anyone think there is Someone of importance present? Why this person was chosen to offer a reflection is yet another question. It presaged a disastrous display of cowardice and confusion among the American hierarchy. Only one bishop of almost 300 had the courage to come out of the hotel and engage with the thousands of laity who were gathered there to pray for the bishops. Even he said he was afraid and didn't know what to expect. Right, the shepherds are so far from knowing what their job is and have so failed in it that they are afraid of the sheep. No wonder they run from the wolves in their midst. It's a deplorable practice, which I have seen in multiple places here in the States in recent years. One priest at least had the decency to note the irregularity, saying before he began, "With your permission, Lord, I will speak in Your presence." I thought the entire affair a bit odd. It is unseemly for people to turn their backs on the Sacrament...yet that is exactly what happens in many churches where the priest at the altar faces the people! And when they bow down to kiss the altar at the beginning of Mass, they are raising their rear ends to the Sacrament! And the problem is not seen. I'm not sure about the truth of it, but I was told about 20 years ago that you weren't supposed to expose the Blessed Sacrament any more simply to give Benediction, but you could do it if Benediction was at the end of something. We used to have the ridiculous thing of Stations of the Cross during exposition. Of course, it might well have all been a load of rot, but it clearly came from somewhere. Perhaps they shouldn't, but the rubrics for adoration of the Blessed Sacrament specifically allow for a homily; and hereabouts (Ohio), it is very common to have a homilist for the Closing of Forty Hours. Indeed, it is often the case that another priest is invited for this honor; followed by drinks and dinner among the clergy. I quite agree that it is "unseemly" to turn ones back on the Eucharist in the monstrance, but only if the monstrance is on a forward-placed altar -- the sort almost always used with an ad populum posture for the Liturgy of the Eucharist -- can this be easily avoided. When I preach in the presence of the Blessed Sacrament, I turn somewhat toward my left, with the Lord just over my shoulder as it were. Regarding what was customary in Forty Hours prior to the revisions of the '60s, I am unaware, but would welcome more information. Something else, which in my opinion is related to this, and which increasingly bothers me is filming and broadcasting/taking and sharing pictures of masses, especially of the elevations. Yeah, i guess the elevation is the "coolest" moment of the western liturgy, but the Mysteries aren't about looking cool and feasting our eyes on the "eye candy". We have gone from guarding the Mysteries from the uninitiated, to even not letting the canon be heard by the illumined ones, to letting everybody see and know everything and it seems that we've cast the pearls before swine. There is also a dose of irony in the fact that those, who advocate the silent canon because it is somehow profaned by being heard by those who are initiated, enjoy sharing pictures and videos of those same moment, and don't mind even the cameras around the altar and snapping the shutter at the elevation. (i was like that too). I'm 59 and remember 40 hours from my youth at St Joseph, Egypt. There seemed to be a rotation of many rural parishes each year, usually in the dead of winter, closing usually included at least 10 to 15 or more priests from the area, big to do, the ladies cooked a big meal with all the trimmings. My dad recounts one year in the 50's when the priest, name escapes me, decided he wanted one long table for all the guests, he was a true handy man, the parish bought him many tools as gifts and he did some real good work and repairs for the parish, he loved to keep busy. Said priest enlarged a doorway between two rooms into an archway, covered the stud spaces with thin fiberboard and covered that with wall paper. The ladies that cooked told the men about it, two of the men in the parish stopped it to see fathers handiwork as they were a little concerned, found he cut through the main supporting wall in the rectory, wonder the house didn't come down. end of story the archway is still there but reinforced properly. For years afterward they joked about how that power saw was not a good gift. As a child I was taken on a Sunday afternoon to 'Rosary, Sermon and Benediction'. I was bored stiff with the first two - to this day I find it difficult to rustle up any devotion to the Rosary - but Benediction, with its candles, incense and chanted Latin, gleaming monstrance, cope and humeral veil, captured my childish imagination in the way that what we erroneously called 'High Mass' (actually a Missa Cantata) did from the age of four. Nowadays I would appreciate a real sermon, such as those given by those with a feeling for English such as JH Newman and GM Hopkins which, since outside of Mass, were not time-constrained. The so-called 'homily' (an unfortunate term, since in English it conveys the idea of a platitudinous little lecture) can be entertaining and instructive in the hands of the likes of Fr Hunwicke but do we really need it at a weekday Low Mass, or at Vespers? I think not. The Novus Ordo needs to be padded out with introductions, otiose explanations, homilies and mini-homilies, and portentous delivery of the lessons by lay people because to read the wretched thing through would barely take up ten minutes. Explain in advance what is in the readings. Then read them in the vernacular. After that, tell people what they have just heard. Get the rest over quickly by using EP II. Sorry, I'm not having it.